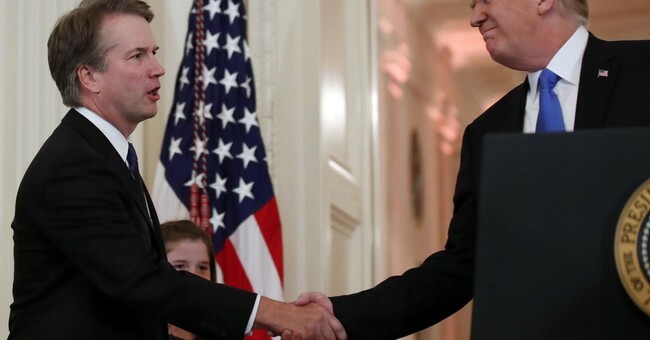 Last night, President Donald J. Trump selected Judge Brett Kavanaugh of the D.C. Circuit Court of Appeals to be our next associate justice for the Supreme Court. He’ll be filling the vacancy left by retiring Justice Anthony Kennedy. It was a highly anticipated decision. The composition of the Court will lead decidedly towards the right if Kavanaugh is confirmed. Hearings are scheduled for the summer, with final vote in early October—just in time for the midterms. Yet, even before the announcement was made, the Left was going berserk. They had a full-blown meltdown when Kennedy announced his retirement shortly after the official end of the 2017 term. The news broke a little after Janus v. AFSCME was decided, dealing a blow to public sector unions squeezing non-union members for dues. It’s now an unconstitutional practice to force non-members to pony up money for activities they don’t support—and labor unions do a lot of that. The chances of an aftershock post-SCOTUS announcement were high, and it’s still not over. We should expect more insanity today and for most of the week. Still, last night saw some very popcorn-worthy drama from the Left. Even before he was selected, the media was characterizing the pick as “controversial.” MSNBC spent a segment discussing ways in which liberals can derail this nomination. The Handmaid’s Tale, which no one watches, is now a reality…in the minds of the unhinged progressive Left. Sen. Chuck Schumer (D-NY) said he’s going to fight Kavanaugh with everything he’s got, which isn’t much to begin with. He’s going to repeal Roe v. Wade, which is liberals’ only concern. He’s anti-worker. And he’s also a pro-gun extremist—whatever that means. Oh, yeah, he’s white; that’s problematic. Great Odin’s raven, people! First, and I’m whipping out my person of color card here, how do I put this delicately: I don’t give a crap. Shoot me, but I grew up under the principle of the best person for the job should get the position. With this job, it’s that, plus experience and impeccable legal credentials, all of which Kavanaugh has and then some. So, it was the usual suspects that went apoplectic last night: former Clinton operatives, the AFL-CIO, NARAL, Center for American Progress, Democrats, anti-gun activists, pro-abortion activists, billionaires who want to impeach Donald Trump, and identity politics adherents. In other words, it was a literal parade of horribles. Fox News host Shannon Bream was planning to broadcast her show live at SCOTUS last night, but protests organized by NARAL outside of the building created an unsafe atmosphere. She hosted her program inside the safety of the Fox News studios. It's about time a conservative white man catches a break in this town. The #SCOTUSPick should be asked their views on sexual harassment, the #MeToo movement, and specifically the long list of allegations against the person who nominated them. #SCOTUS is going to hear many sexual harassment cases and we need to be able to gauge the nominee's views. There will be a big protest organizing at the supreme court tonight at 9:30PM organized by @NARAL. It’s vile that we live in a country where women are still expected to calmly explain why criminalizing abortion kills us. Kavanaugh would bring all of Trump’s worst qualities to the Supreme Court for decades to come. Trump chose Kavanaugh from a list of preapproved, guaranteed votes to gut and overturn Roe v. Wade. Brett Kavanaugh for Trump’s 2nd #SCOTUSpick. Be scared. Very scared.